Movie Ramble: Song for Marion. When I wrote my blog about The Best Exotic Marigold Hotel (2012) I ranted my displeasure that the film industry in Britain seem to take pleasure in pigeon holing a section of the public in what I see as their quest to demean people of a certain age whom they imagine cannot enjoy a movie that’s challenging and/or graphic in its contents. We’ve recently had Dustin Hoffman’s Quartet (2012) described as a comedy and happy to show a fantasised Care Home with out a hint of reality. European and even American filmmakers can make films without patronising adult audience. Take for instance Michael Haneke’s award winning Amour (2012) or Yaron Silberman’s A Late Quartet (2012) not the best film I have ever seen but one that does not treat its audience as a bunch of maroons. Arthur and Marion share a joyous moment. Director Paul Andrew Williams has a good pedigree for films with bite, including London to Brighton (2006), a social realistic crime drama about child prostitution and runaway youth, and Cherry Tree Lane (2010) where a prosperous middle aged couple receive unexpected visitors to see their son about a wee matter of grassing up one of his friends and take out their frustrations on the parents while waiting for his return. Now we get him trying his hand at what’s can only be described as promoting a movie aimed at an undemanding audiences of a certain age, people who are believed not to require a great deal for the price of a cinema ticket. 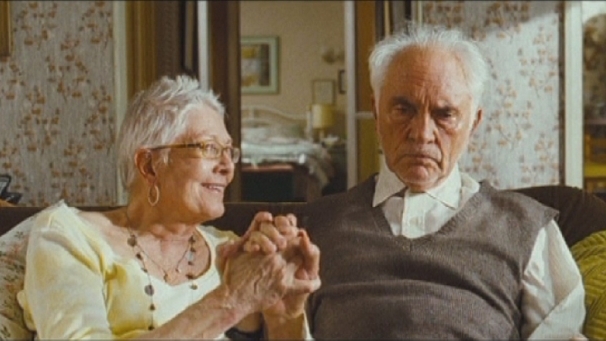 Song for Marion (2012) would have been a far better film if it had concentrated on the three way drama between a retired couple, the grumpy misanthrope Arthur (Terence Stamp), his wife Marion (Vanessa Redgrave), who is diagnosed with terminal cancer and they’re grown up son James (Christopher Eccleston), who has a daughter but apparently no wife. Instead Williams concentrates on a cranky implausible choir called the OAPz, led by a young condescending music teacher (Gemma Arterton), that the wheelchair bound Marion is a member of. This movie demonstrates how bad the British film industry can be at times. Its safe, unimaginatively gutless and completely predictable, trying far to hard to bring a mawkish tear to your eye. An embarrassing sugar rush that wastes the acting talents of those involved.